Home / ProjectorCentral Q&A / Should I Use a White or Grey Screen for my Viewsonic Projector? Should I Use a White or Grey Screen for my Viewsonic Projector? Q: I read ProjectorCentral's review of the Viewsonic PX727-4K and am seriously considering buying it. My confusion is around which screen to choose for this projector. I have a light controlled room with dark painted walls but a white ceiling (ceiling is 11 feet). Silver Ticket sells a 1.1 gain white screen and a 1.0 gain grey screen, and given the fact that this and other similar projectors have decidedly average contrast performance, I can't decide which one to go with. Any help would be appreciated! A: Hassaan, when deciding on a long-term purchase, such as a screen, it’s great that you are looking at both the projector and the room as considerations. Most often, the best choice for any room is a white screen, but a grey screen can help with boosting perceived contrast and reducing the impact of reflections from a white ceiling. In your specific setup, it’s a very appropriate time to use a grey screen. But, is it definitely right? That’s always a question that I think individuals need to answer on their own, and the only way to do that is to know what content you watch, how much you value the pop of a bright image compared to a jump in contrast you may get using a neutral gain grey screen, and then figure in if the projector you are buying has the extra light output to handle the slight fall-off of brightness that grey screens typically deliver. 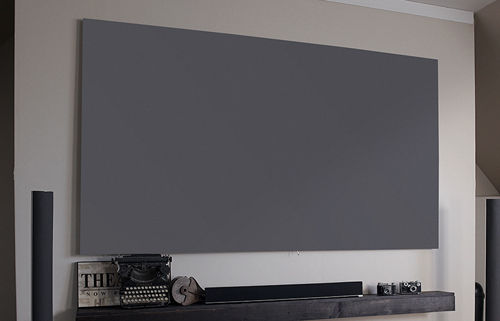 A grey screen (such as the Elite CineGrey 3D screen shown here) can help boost contrast and perceived black level when there are concerns with room light, a reflective white ceiling or walls, or a projector's inherent contrast. But it comes at the expense of some image brightness. What you choose will depend on your conditions, the projector, and what image qualities you perceive to be most important. In the case of the Viewsonic PX727-4K, which is a reasonably bright projector (2,200 lumens specified, 2,029 measured for our review) with good black levels, and assuming a screen size of 120 inches diagonal or less, you likely can get good results from a grey screen in this room, and it is something I would recommend. Since you have a room that is ideal for a grey screen, why would you or someone with similar conditions still consider a white screen? Because white screens tend to deliver a bit more pop to the image. They don’t dull the image in any way and often add a bit of gain which makes the whites appear more vibrant. While a grey screen can enhance the blacks, it can make an image appear somewhat dull by comparison with white material, especially with dimmer projectors, larger screens, or aging lamps. This is becoming less of an issue with newer projectors which have higher brightness to compensate and better contrast to begin with. But, the newest 4K DLP models don’t have the same reported black levels of the previous generation 1080p models at this time, so getting a bit more contrast with a grey screen is a good thing. What to watch out for? The screen material is always something to take care in selecting. Read whatever reviews are available for any screen and surface which is to be used, paying close attention to negative reviews. Be aware that missing hardware, or the occasional wrong fabric being sent can happen, but is a rare occurrence. Instead, look for reviews that speak directly to the quality of the image that the material reproduces. Got a question for ProjectorCentral Q&A? Submit it here for possible publication. The first thing you should consider when looking for a screen to pair with your 4K projector is the texture on the surface. Silver Ticket does not make a textureless screen surface and the texture on their surfaces will distort the geometry of the pixel. This distortion will render non-square pixels which leaves you with an image that is not 4k. Be wary of inexpensive screen brands using the phrasing of "4k ready" as that is really a meaningless construct. Stick with true 4k+ surfaces from brands like Stewart, Screen Innovations, Da-lite and other premium brands if you want to get the full benefit from your 4k+ projector. I think screen texture is a fair concern to raise and one that should always be considered with 4K projection, where a coarse texture may be more evident due to the finer pixel pitch. And I have no experience with Silver Ticket screens to weigh in one way or another on Brian's observation. But for purpose of full disclosure, readers should be aware that the poster here is associated with one of ProjectorCentral's affiliated screen resellers who deals in the premium brands he mentions, while Silver Ticket is a value brand that sells direct to consumers. I believe both product classes contribute viable options for our industry that fit different consumers and ensure that a wider range of enthusiasts can enter into and enjoy the benefits of front projection. But it behooves anyone shopping for a screen to educate themselves on how different manufacturers add value to and differentiate their products. At the end of the day, screen science is pretty sophisticated stuff and it's getting more so as we enter into the new age of ALR screens. I don't trust all that much any of the screen manufacturers, so my advice would be to make your own screen. I also dislike the rather foul smell of these large sheets of vinyl screens in an enclosed, windowless room. Sometimes the odor lingers on for months or longer. We are making 5.7 meter wide screen now here in Europe, in the aspect ratio of 2:1. Fiberglass reinforced gypsum boards that they sell here 1 meter and 50 centimeter wide. Since we curve the screen at an 8-meter radius, this works great for the quasi-Cinerama, Super 70mm panoramic effect. Level 5 finishing at the joints, then the primer and then the top layer paint. We did try two makes of dedicated screen paints, they were great, much, much better tan one could get with vinyl sheets. We then found a particular silver paint locally that is just as good and costs a fraction of the price of a custom screen paint. Measured gain is about 0.93. The price quote we got from "name" PJ screen maker for a screen this size that is curved was around $30K (frame and screen fabric). So far, we are looking at $1,250, and that includes the labor for building the metal stud fame onto which the gypsum boards were affixed. If you are staying with vinyl, you must get from the mfr a swatch of the fabric they use, usually this is going to be size 8 x 10-inches or smaller. Do not order a screen until you have seen a small sample swatch of the fabric. Stunko, thanks for sharing your screen-making adventure with readers. I wouldn't go so far as to say that screen manufacturers can't be trusted, nor that a painted screen will always outperform good screen materials. Nor that everyone is capable of the a project of this sophistication. But it's admirable that you've managed to save a substantial amount of money on such a large, curved screen. Well done! I have a 135” Silver Ticket high contrast grey paired with a 5040 Epson. It’s an unbelievable combo. I see/have no texture issues with that screen. I have no hesitation recommending STR screens.